On Thursday, December 5th, American University got a special guest star on campus: President Barack Obama. 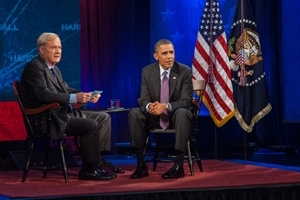 For a taping of MSNBC’s political talk show, “Hardball with Chris Matthews,” Obama fielded questions on health care, economic justice, and other matters. It was the latest edition of the show’s college tour. In his first question, Chris Matthews asked what brought him on the show. “American University,” Obama replied to applause. “I’ve had just wonderful experiences here,” he said, noting that the late Sen. Edward Kennedy, D-Mass. endorsed him at AU during his 2008 presidential campaign. AU students were enthusiastic about seeing the leader of the free world up close. “To see him in person is something that not many people get to do,” said Alex McQuade, an AU junior. While studying abroad in South Africa, senior Nicole Mularz missed out on an opportunity to see Obama speak. So she was grateful for his visit to AU. “This is a very unique opportunity,” she said. This semester, McQuade and Mularz are both interning at the Senate Foreign Relations Committee, which Obama served on during his Senate tenure. “Not only did I vote for Obama, and I’m a supporter, but having that connection of him being on the committee is really exciting,” Mularz said. Matthews, a political analyst and ex-aide to former House Speaker Tip O’Neill, D-Mass., zeroed in on the most controversial domestic issue of the moment: the Obama administration’s troubled rollout of the new health care law. Matthews mentioned that some young people have been resistant to enroll in the new health care exchanges. In response to a question about privacy issues, Obama addressed the National Security Agency wiretapping controversy. Obama also noted an ongoing review of the programs. “I’ll be proposing some self-restraint on the NSA,” he said. Throughout his presidency, Obama has been engulfed in high-stakes battles with House Republicans over government spending and the budget. Matthews asked Obama about gridlock in Washington. Obama insisted that he’s been willing to compromise with the GOP. “When we have divided government, most of the time, there’s about 70%-80% overlap between the parties,” he said. He thinks a deal is possible on immigration reform, even with some resistance from conservative House Republicans. “I continue to be optimistic we’ll get it done. And I think [House Speaker] John Boehner is sincere about getting it done,” he said. Chandler Thornton, a junior in the School of Public Affairs, has an alternative view of the lack of bipartisanship in Washington. "In the past, that's not necessarily what we've seen from the president," Thornton said. "If the president is willing to compromise with the GOP, he needs to be able to show he means it by first unifying his own party [the Democratic Party]. In several policy debates recently, it has been the GOP that reaches out for compromise and it has been the GOP that gets shut down by the president." Matthews talked about Obama’s recent remarks on economic justice and helping those less fortunate. At one point, Matthews invoked another presidential visit to AU: President John F. Kennedy’s historic 1963 commencement speech here calling for a nuclear test ban treaty and mutual understanding with the Soviet Union. “I have that confidence,” Obama replied. The president explained that this generation of Americans lived through plenty of turmoil, including the September 11th terrorist attacks and the worst financial crisis since the Great Depression. “We’re still the envy of the world and the one indispensable nation,” Obama said, while extolling the nation’s scientific innovations and strides towards energy independence. Towards the end of the discussion, Obama became reflective about his time in office. He said that after five years, the job has humbled him. “You recognize that you’re just part of a sweep of history. And your job really is to push the boulder up the hill a little bit before somebody else pushes it up a little further,” he said. Jeanna Lee, a student at AU’s Washington College of Law, responded positively to Obama’s message and appreciated his emphasis on public service.